3D Laser Scanning is a non-invasive technology that digitally captures the dimensions and spatial relationships of objects using a line of laser light. The scanner produces an accurate representation of the scanned object with a dense point cloud image made up of millions of points. 3D laser scanners are able to scan something as small as a pencil, or as large as an airplane or building. If an object is too large to be captured in one scan, multiple scans from different lines of sight can be linked together to create a complete point cloud image. Terrestrial based laser scanners produce point cloud data as well as 360° panoramic imagery. These can be used to produce several deliverables across many formats for diverse project types, ranging from interior building surveys to transportation and industrial applications. 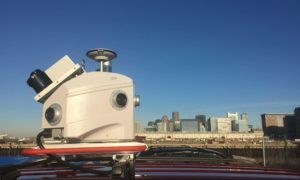 Mobile LiDAR systems are comprised of vehicle-mounted lasers, cameras, and GPS/INS navigation systems. They capture highly-detailed and accurate 3D topographic information for surveying and engineering applications. The speed of data acquisition compared to terrestrial based laser scanners is significantly faster, which allows for significant efficiency and reduced time in the field. With the laser scan data, Control Point Associates, Inc. regularly produces detailed façade surveys, 2D floor plans, 3D models, floor deviation surveys and technical as-built plans. Depending on the client’s needs, these deliverables can be produced in AutoCAD, Civil 3D, Revit, MicroStation or many other formats. A TruView Virtual Environment can also be produced from the point cloud data and imagery. TruView is a web-based application that allows the user to access a 3D virtual environment of their project – which contains both the point cloud data and the panoramic images – from anywhere in the world. This provides benefits such as the ability to pan around the project area, make measurements and add notes for collaboration with others. 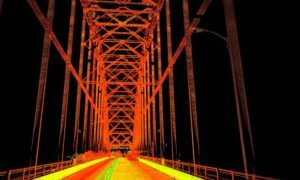 3D Laser Scanning is utilized in both the construction and maintenance of bridges, roadways, tunnels, airports, railways, ports and docks. Some typical uses are roadway topographic surveys, surface and pavement profiling, paving volume calculations, intersection surveys, along with bridge design as-builts, damage assessments and historical archiving. Laser scans can be used to develop accurate 3D models of the interior and exterior of existing buildings, which aid in planning and designing future additions or renovations. The scans are also useful for historic preservation and preserving the historic aspects of buildings, as well as creating an accurate model of the original architecture. 3D Laser Scanners are often sent to the scene of accidents to assist with evidence preservation and forensic evaluation. Instead of relying on photographs and field measurements, 3D laser scans can assist forensic engineers and legal teams by quickly and accurately preserving an accident scene and its evidence. Once data is collected, it can be converted into 3D models for use in mediation, arbitration or litigation. 3D Laser Scans can accurately document existing conditions of a facility to assist with conflict resolution between new and existing components during facility upgrades. These scans allow personnel to remotely view and evaluate the data, aiding in redesigning facilities to make them run more efficiently. Acquiring hand measurements can be dangerous. The remote sensing ability of 3D laser scanning keeps workers out of harm’s way, increasing accuracy while saving time and costs. In addition, the capability to capture data quickly can reduce a field crew’s exposure to harmful environments. Since all scans are done with lasers, there is no need to physically touch an object being scanned. This is important when scanning historic objects, buildings or artifacts, as well as something that is physically out of reach. Scanning the Castillo San Felipe del Morro in San Juan Bay, Puerto Rico was more practical than trying to traditionally measure the structure. Most 3D Laser Scanning projects have a shorter field schedule than traditional methods by as much as 10%. The scanning can take a few hours to a few days, depending on the size of the site, compared to several weeks using more traditional methods. In some cases, the savings in time can greatly impact project costs. 3D models and point cloud data allow for workflows than traditional surveying methods are unable to provide. Precise imagery and highly accurate scan data can analyze clashes between existing conditions and proposed designs, which helps eliminate waste and changes in the field. As experts in 3D Laser Scanning, Control Point Associates, Inc. is uniquely qualified to provide geospatial and consulting services on your next project. 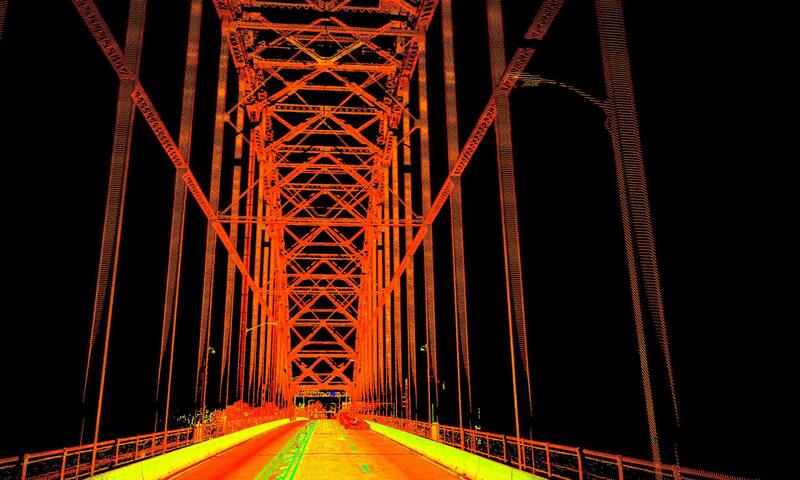 To learn more about our 3D Laser Scanning services, call (800) 668-1819, or email us today!